2014! A new year now lies ahead, adding a year to our ages and anniversaries and memories. In recent years, whenever Don and I celebrate any anniversary (birthday, wedding, our first date, our move to Sandwich, etc. ), I find myself counting the things that didn’t exist back then—such as, depending on the anniversary: we didn’t have a flat-screen TV then—or we didn’t have a color TV—or we didn’t have any TV whatsoever. No TV? At that particular thought, childhood memories zoom in, of sitting at the kitchen table with my sister, Penny, listening to radio programs—The Shadow, Nick Carter, The House of Mystery—while playing double solitaire or drawing pictures on pieces of our father’s ream of manila second sheets, and munching popcorn popped in a wire basket shaken over a stove burner, not popped in—hey, another thing that didn’t exist then!—a microwave. Speaking of TV. When it went digital a few years ago, Don and I lost our PBS channel. We now can only get the three basic channels, and they become two in the spring when the trees leaf out. Of course, we’re still using a roof antenna . . . which we can’t get serviced any longer. Lightbulbs don’t cast light anymore. Don’s mother was a telephone operator. She had a distinctive voice, so you knew who it was when she said, “Number, please.” Don and I don’t have iPhones, just regular landline phones and one simple cell phone, but they are always causing problems. And people who phone us on their cells have problems too; they crackle in and out and vanish. I say wistfully to Don, “Remember when telephones used to work and your mother used to say, ‘Number, please’?” And this doesn’t even start getting into the maddening problem of telemarketing calls day in day out. Warner’s has stopped making my favorite line of underpants, so in department and lingerie stores I’m now seeking a replacement, thus far in vain. A quest for a holy grail! Penny points out that it’s hard to find dresses and slacks with side zippers. Here’s one that everybody of a certain age talks about. At gas stations, back when the price of a gallon was today’s pocket change, you didn’t have to pump your own gas. It was done for you, your windshield was cleaned, the oil was checked, and the gas station gave you presents, like steak knives and S&H Green Stamps. Once during a series of fill-ups I acquired an entire set of spices and a spice rack to put them on. I enjoy sitting in an armchair and browsing through a catalog. I don’t want to look at items on a screen. I relish the feel and smell of a new L.L.Bean catalog. Speaking of browsing and catalogs, we miss browsing through library card catalogs, those splendid pieces of furniture. It was fascinating to hunt through the card trays for some subject and learn more than what you were searching for. Don, retired librarian that he is, thinks all libraries should have saved their card catalogs, at least for backup if not for beauty. Nowadays you need a special implement, a package opener, to open impenetrable plastic packaging. And I had to buy a special gadget to pull the tops up and off soup cans, in a terrifying maneuver. How did these lethal tabs on cans ever get past safety regulations? When shopping, I look for cans without tabs, to be cranked open on our can opener. Speaking of supermarket-shopping, paper grocery bags don’t seem as strong as they used to be. And some cashiers look at you in a hostile manner if you request paper, if you don’t want plastic bags flopping around and spilling. The new Glade spray-can design doesn’t spray. It spews and oozes and clogs. Curtain-shade pulls are becoming extinct. Don and I are also fond of salt cod, another winter treat. We’re even fond of the small wooden boxes it is sold in. I make the creamed cod that our mothers used to make and also a salt-cod chowder whose recipe I created from various sources, including Julia Child. This winter the supermarkets around here aren’t stocking salt cod, and the reason for this is, we are told, that there isn’t any demand (except us). It’s become too old-fashioned? Gilbey’s gin bottles are no longer frosted. An old family friend in Massachusetts, known as Aunt Dot and the inspiration for my novel Aunt Pleasantine, always brought a bottle of Gilbey’s when she came to visit (as well as a box of coconut cakes from Bailey’s in Boston). To my young eyes that frosted bottle seemed as pretty as ornamental glass. Ah, glass bottles! Don and I are sure that the Coca-Cola in the green glass bottles of our youth tasted colder on a summer day than in any of the Coke containers that followed. 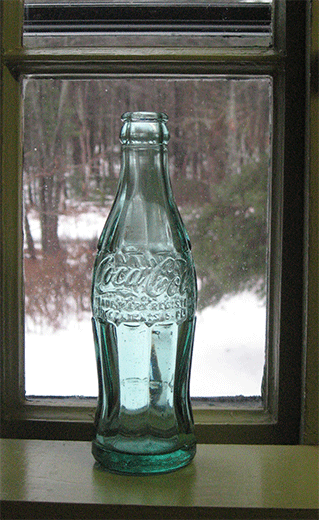 There was a Coca-Cola bottling plant in our hometown, Laconia, and you could stop on the sidewalk and look in the big windows at the green bottles going around and around. Did the term “recycled” exist back then? 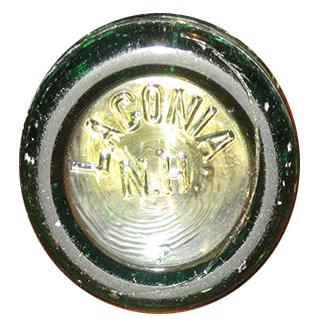 Whenever we bought a Coke anyplace, we checked its bottom to see if “Laconia” was there in raised letters, to identify its place of birth, the same as our own. I know this lament will continue into the new year, but it is in its way a celebration—of the past and of our luck in having lived long enough for this long look back. And there are new things to celebrate. We recently found just the right shade pulls, thanks to the Internet. Now, for the underpants quest . . .